Isabel Marant makes ready-to-wear and accessories that fashion’s “It” girls can’t help but covet. With each collection, she shows us just why we envy Parisian women’s relaxed chic style and even makes mini dresses look easy. For Fall, she is channeling the Navajo spirit with patchwork denim, cozy knit sweaters and feather and fringe embellishment. Outerwear for the collection is oversized and edges on the side of masculine which looks great on the runway, but might not translate well for petite women, like myself. My idea: Add a belt (like Elegantly Waisted’s Cummerbund Belt – $121) to emphasize your waist and figure. Drowning in fabric has never been attractive. Marant makes shearling look cool and rugged, lining roomy denim jackets and covering vests which are definite must-haves for the season. Other standout pieces are a poncho-style dress, a cozy cream turtleneck dress with an asymmetrical hem and the suede fringe boots that were paired with every look in black, grey and white. If you can’t already see those on the likes of Emmanuelle Alt and tons of models, then you might not be looking hard enough. Perfect way to wear all the leg-baring looks is with tights of course because once Fall gets underway, bare skin is the furthest thought from one’s mind. 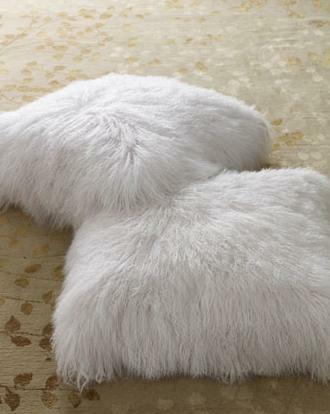 Adrienne Landau’s Mongolian lamb’s wool pillows ($645) to add some flair to your home. 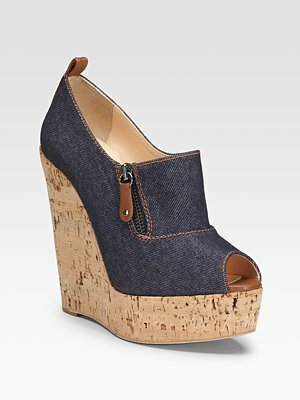 Get Spring and Summer perfect with Christian Louboutin’s Deroba wedges ($595). 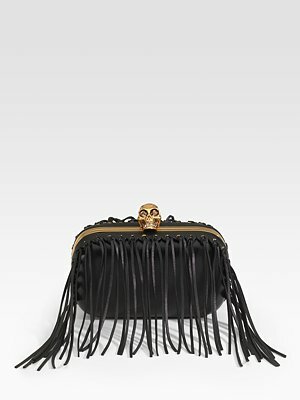 Alexander McQueen’s fringe skull clutch ($1,495) as your wardrobe’s new statement piece. Visit www.isabelmarant.tm.fr for more information and see more looks from the Fall 2011 collection below. *Isabel Marant images courtesy of Imaxtree.